The former Texas Tech head coach hasn't been able to talk to NFL teams until now, reports say. GLENDALE, Ariz. - After firing Steve Wilks following the final game of a dismal 2018 season, the Cardinals are in full search committee mode looking to hire their next head coach. 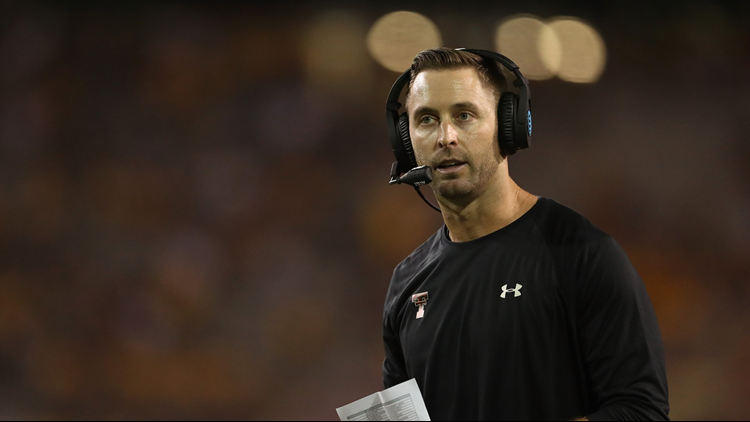 According to Monday reports, a new name may have just jumped to the top of the list, former Texas Tech head football coach Kliff Kingsbury. Kingsbury was fired in November after a losing season. He quickly took an opportunity with USC as an offensive coordinator. According to several national reports Monday, that is no longer the case, which means Kingsbury likely resigned at USC to pursue NFL opportunities. According to Adam Schefter, Kingsbury and the Arizona Cardinals have mutual interest in each other for the head coach spot. A true Romeo and Juliet situation, as our own Matt Johnson points out. Hopefully this version has a different ending. The 39-year-old is known for his high-powered offenses. Since he became an offensive coordinator in 2011, his offenses have scored more than 40 points per game while averaging almost 550 yards per game. Kingsbury could come into Arizona with the opportunity to coach up a young quarterback in Josh Rosen and try to work his magic to reinvent a stagnant offense. Reports also say Kingsbury is a candidate for the New York Jets head coaching spot and the New England Patriots offensive coordinator position IF Josh McDaniels leaves the team to take a head coaching job.